Sandyford is perfect for professional lets. 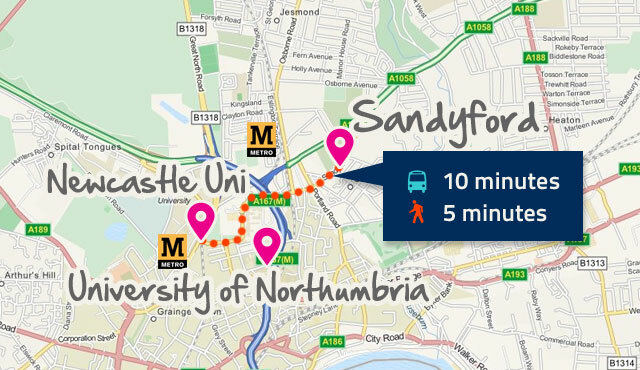 Sandyford sits in-between Newcastle City Centre & the popular are of Jesmond and is ideal for city living for professionals who like to be close to the town centre and Jesmond. Aswell as being extremely close to the city centre and Jesmond our professional lets in Sandyford are extremely close to Newcastle Town Moor which is 1000 acres of greenbelt for local residents. Prem Lets offer professional lets in Sandyford, to arrange viewing please contact one of our team. If you are new to Newcastle or Sandyford please feel free to let one of the team know and they can help in making you familiar with the local area. Located at the bottom of Springbank Rd, this is a traditional style pub which was recently opened at a classy location for students. It offers both home cooked food and a beer garden. You can also have the pleasure of trying out the weekly pub quiz. Another great little Italian eaterie which you will find on Helmsley rd. It offers all the usual Italian classics. You’ll find this on Starbeck Ave, this cafe is well known for its delicious pizzas and pasta dishes. If you fancy some home cooked Italian food then this is the place to visit. Coffee house and bar with the odd splash of live music. Sandyford’s traditional Italian eaterie with the menu not just for pizzas and pastas. With ingredients brought over from Italy to give that authentic feel.